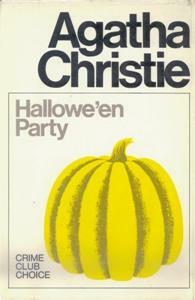 Having recently watched the excellent dramatization of this book on DVD (with David Suchet, of course, as Poirot and Zoe Wanamaker the absolutely perfect Ariadne Oliver), I figured I'd give Christie's Hallowe'en Party a go in book form. After finishing it late yesterday afternoon, I found myself agreeing with a contemporary reviewer from the Toronto Daily Star who wrote that "Poirot seems weary and so does the book." It was a bit disappointing in that I'm used to actually seeing Poirot's little gray cells at work, and here, while he does solve the mystery, it's just not the same as the older Poirot novels -- he does indeed seem incredibly tired. Poirot's less than lackluster self combined with several missed character opportunities made this book not as fun to read as I'd hoped. The plot itself is an incredibly good one. The wealthy Mrs. Rowena Drake, who has her fingers in every social, civic and church-related pie in her village, throws a Halloween party at her home for the "eleven-plus" group of kids. Ariadne Oliver happens to be in the neighborhood, staying with her friend Mrs. Butler, and they both attend the party. Mrs. Oliver is famous, of course, and one young girl (Joyce) tries to impress by telling her about the time she saw a murder happen. 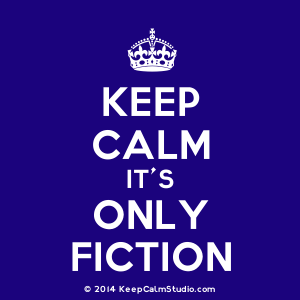 Of course, she says, she didn't realize that it was a murder that she was seeing at the time, but now she realizes the truth of it. Joyce, who has a penchant for story telling and making things up, is pooh-poohed by everyone at the party -- no one believes her and they make fun of her for making up something so outrageous. But someone must have believed her, because when the party ends, Joyce is discovered head down in a tub filled with water meant for apple bobbing. Poirot is visited the next day by a very shaken Ariadne Oliver, who tells him what happened. He latches on to Joyce's tale of murder, leading him to go to the scene of the crime. 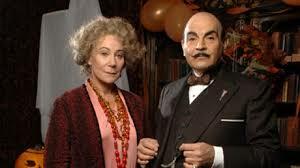 Zoe Wanamaker (Ariadne Oliver) and David Suchet (Poirot) in "Halloween Party"
While the plot is good, I think Christie missed the boat on this one -- it most certainly isn't the best of Poirot and it isn't the best in terms of clues for the amateur armchair detective to follow. I just don't feel like she utilized those skills in this book that made her such an enduring mystery writer. When it comes down to the who and the why, things seemed rather shaky and I found myself saying things like "but what about..?" more than once. I hate plot holes, no matter who the writer is, and there are definitely a couple or three sinkhole-sized ones here. So the long and short of it is great plot potential, but not so hot in the execution. I suppose even Agatha Christie can have an off day, and it definitely shows in this one.